Arenanet’s Guild Wars 2 sale, and in-game sale is now on. If you’re a fan of the game, and likely to be spending cash in the next month or so, now’s probably the time to whip out the wallet. The digital deluxe edition has been reduced to the same price as the standard edition, making it a no brainer if you’re planning on buying Guild Wars 2. You get a bunch of cool extras including a rare mini-pet, an elite skill that summons a Mistfire Wolf to aid you in combat, various one time use boosters to influence and glory as well as a golem banker so you can access your bank from anywhere. 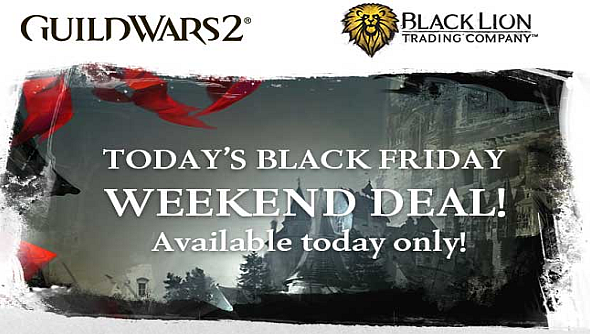 If you already own Guild Wars 2 then the in-game store has some revolving deals. Today, there’s a discount on 25 Black Lion Keys used to open rare chests. Fine Transmutation Stones are also reduced at 120 gems for 5, 215 gems for 10 and 480 gems for 25. Use these to transfer the aesthetic look of one weapon to another. Lastly, Black Lion Merchant Express, are on-sale at 50 gems for 5. These allow you to bring a merchant vendor around with you wherever you go. The gem store deals end 08:00 GMT where a new daily deal will begin. The digital deluxe deal ends later on the 26th of November at 20:00 GMT.